RESEARCH THAT GIVES VOICE TO THOSE WHO ARE MOST AFFECTED BY POVERTY, VIOLENCE AND CONFLICT. “There is no replacement for street sense”, a group of young men tell me while squeezing out the last drops of cheap whisky from little plastic bags. It’s a hot, sunny, mid-summer afternoon. I find myself in the remains of a crumbling market hall situated downhill in a district called Belgium in Freetown. At first sight, the densely-crowded hall seems quite intimidating, disorganised and chaotic. Women with their babies hoisted onto their backs are selling food, soft drinks, alcohol, snacks and tobacco. Young men are trading knock-off designer footwear and shirts next to a group of males gambling for money. “This is our casino.” explains a local. Disabled men try to make their way between piles of cassava leaves and girls washing clothes in big colourful buckets. A tailor is diligently working on a sewing machine that seems to date back to the early 20th century. Sound waves of various music genres float in from all angles. Children are playing cheerfully on the fringes of the hall – next to garbage, loose chicken and a dirty little stream. The locals have nicknamed this area “Ajekuleh”. Everyone is welcome from every corner of the city. Ex-combatants mingle with students, the unemployed youth, artists, okada drivers, prostitutes, ex-prostitutes, local politicians as well as formal and informal businessmen. They drink, smoke, eat, dance together, engage in passionate discussions about all sorts of issues and daily affairs. People also come just to sit down, relax and take a break from the busy life in Freetown. The fact that I was the only white person among them who also happened to be female did not seem to perturb anyone. A few shake my hand and ask for my name while others offer me cigarettes. Some are curious about the purpose of my visit but all of them ensure that I am sitting on the most comfortable part of a shaky bench. “Simone, in this place you will find the good, the bad and the ugly. Just sit and watch,” whispers a local friend of mine. So I sit down and watch the daily routine of the Wild West in Freetown. In time, I hear stories about corrupt elders, how informal businesses are ruled by unwritten laws, how people educate themselves in the streets when they do not have the opportunity to attend school, how they have to bribe the police when raids are occasionally conducted in the area, and how ghettos here in Freetown differ in social strata, unofficial policies and style. All of this and much more, here in Ajekuleh, happens on historical soil. Their lodging-rooms below the deck, which are three (for the men, the boys and the women), besides a place for the sick, are sometimes more than five feet high, and sometimes less; and this height is divided towards the middle for the slaves lie in two rows, one above the other, on each side of the ship close to each other, like books upon a shelf. I have known them so close, that the shelf would not easily contain one more. And I have known a white man sent down, among the men to lay them in these rows to the greatest advantage, so that as little space as possible might be lost. (…) And every morning, perhaps, more instances than one are found, of the living and the dead, like the captives of Mezentius, fastened together. More than 200 years later, many people call the long stretch of slums around the coast of Freetown their home. Areas such as Kroo Bay or Susan’s Bay are congested, overpopulated and can be extremely dangerous especially during rainy season. Children frequently get swept away by floods along with their houses. A young man in his mid-twenties tells me that he prefers to sleep in the streets during the rainy months as it is simply too dangerous to stay at home. Less than three months ago, he lost his dwelling and all his belongings in one night. He is still coming to terms with the loss but is nevertheless happy to be alive. Five people from the community did not survive. Various attempts to relocate inhabitants from the slums along the coast have failed so far. 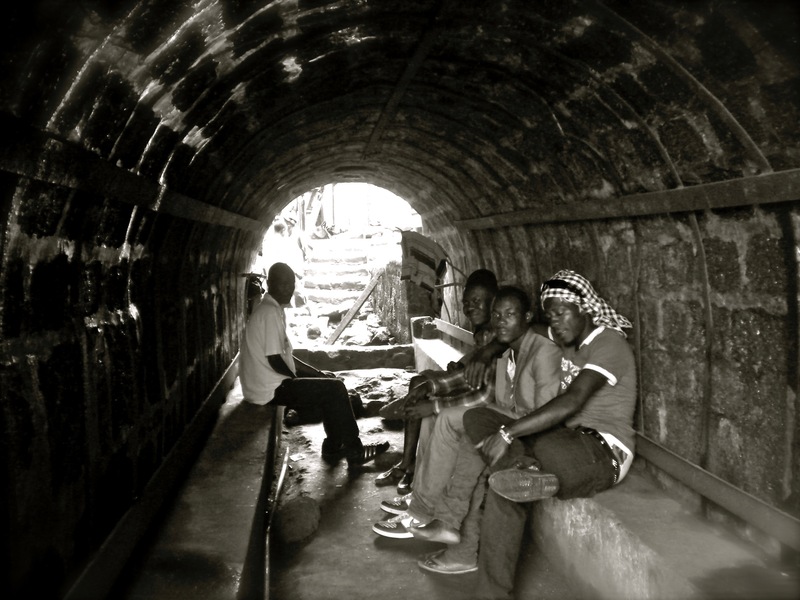 I notice a couple of young men sitting inside the slave tunnels. Locals tell me they come here to eat, smoke, drink and carry out their informal businesses. Along with the market hall, it is another regular meeting point. It almost resembles a public park bench in the middle of the town. “What kind of changes would they like to see in Ajekuleh?” I ask. Ideally, they would like to create an international business centre so that people can do business on a much larger scale, they tell me. Our location, standing inside the slave tunnels, is not much of an issue in our conversation. I wonder how they feel about the past? “Oh Simone, this happened a long time ago. We like you white people from the West!” they reply. I kept on returning to Ajekuleh on occasion. I sat down, watched and listened. What struck me most is probably the tendency to overlook the bad, focus on the good and ignore the ugly when it comes to the Sierra Leonean relationship with the past. Founder of the Wesleyan movement.